Younger Women's Task Force: Did Kuwaiti Women Really Win? The question of whether Kuwait’s Thursday election was a success or a failure depends solely on your point of view. My first reaction upon seeing the following headline in the Washington Post this morning was dismay: “No Women Chosen in Kuwaiti Vote.” Yesterday was a historical landmark, as it was the first time in Kuwait’s history that women could turn out to the polls, and yet none of the 27 female parliamentary candidates were elected. How depressing, I thought. Yet there are many factors that contributed to the seeming “failure” of this new electoral process, none of which aided the women candidates or women voters in their quest. (1) Kuwait’s emir, Sheik Sabah al-Ahmad al-Sabah, dissolved parliament in May and moved the election, which was supposed to be held next year, to this month, meaning that the female candidates had only a month to prepare and campaign. 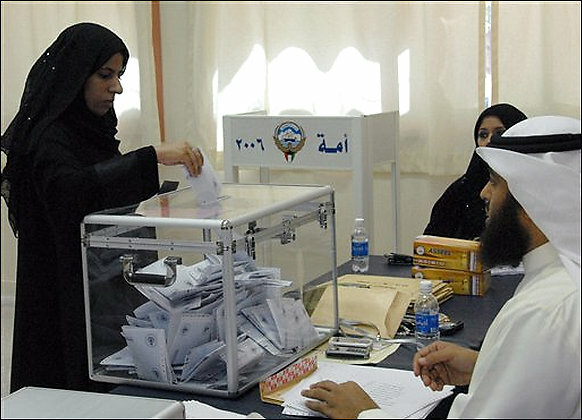 (2) The Kuwaiti women voters faced opposition from both highly conservative men and women. Some of the conservative women, in fact, showed up to heckle the voters in line and to cheer raucously for male candidates. (3) It was at least 120 degrees outside and the voting stations were not easy to get to. But now let’s focus on the subtitle of the article, which reads: “Advent of Female Suffrage Seen Forcing Attention to New Issues.” In other words, Kuwaiti women have the power now. They are a large constituency (they make up 60% of the electorate) and candidates will have to tailor their agendas to fit the needs of women if they expect (re)election. I want to make sure that we don’t read “No Women Chosen in Kuwaiti Vote” and think to ourselves, “women won’t even elect their own to office.” The beginning of this article gets dangerously close to this assumption in saying, “…Kuwaiti women, voting for the first time, chose not to put a woman in parliament in Thursday’s elections.” Well, was it just the women who were voting? Absolutely not. There were conservative voters to combat, not to mention the experience and time that the male parliamentary candidates had. The results of this election should not point to despair and cynicism, but rather to a powerful hope that, in time, Kuwaiti women will continue to grow in political power. Just looking at the reactions and the determination of many Kuwaiti women should give us a good feeling about what’s to come. "We'll keep up our struggle and will fight until we see women in parliament," said 42-year-old economist Dashti, who won 1,539 votes, the highest of any female candidate.